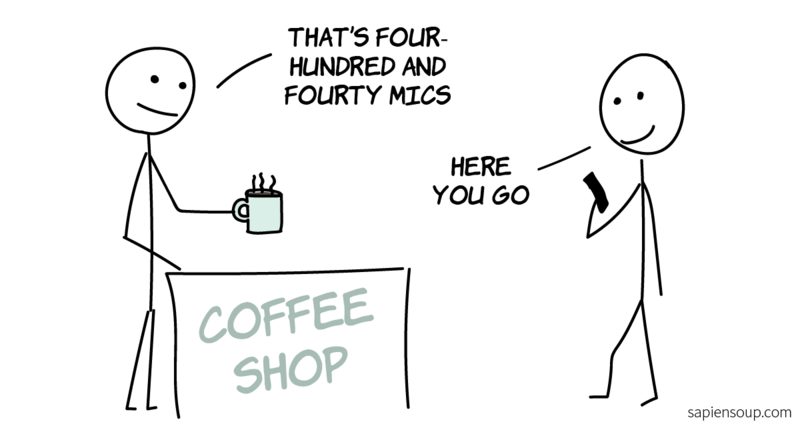 A coffee currently costs 0.00044 bitcoin. Zero, zero … what? Our brains treat a decimal point like the end of a sentence; what’s after the decimal point gets disregarded. Marketing managers have known this for ages, and that’s why a coffee usually costs $2.99 instead of $3.00. If you want to pay for your coffee in bitcoin—which no one in their sane mind does—here’s the fun you’re getting yourself into. After the year 2012, when the bitcoin price once and for all left the double digit dollar range, there was never again an easy-to-handle price for your coffee. If you’re struggling with 8 digits after a decimal point—you’re not alone. The alternative, satoshi, isn’t much better either. Satoshis are like the pennies of bitcoin, but where there are 100 pennies to a dollar, there are 100,000,000 satoshis to a bitcoin. This means that denominating prices in satoshis is a little bit like living in country with a hyperinflated national currency. Take for example Vietnam’s dong: one dollar will buy you 22,800 Vietnamese dong. Thus, a $3 cup of coffee would cost 68,400 dong. Not convenient. Today in bitcoin-land, you have to choose between displaying prices using (a) a very small number denominated bitcoin, or (b) a very large number denominated in satoshis. What’s missing is something in the middle. I like the metric system because it scales effortlessly. As bitcoin rises in value, prices will move from the mili range into the micro range and eventually into the nano range, at which point it actually becomes practical to denominate prices in satoshis. You might ask yourself how many decimal places we will actually need and use over time. To answer that question we have to know where the price of bitcoin will settle. 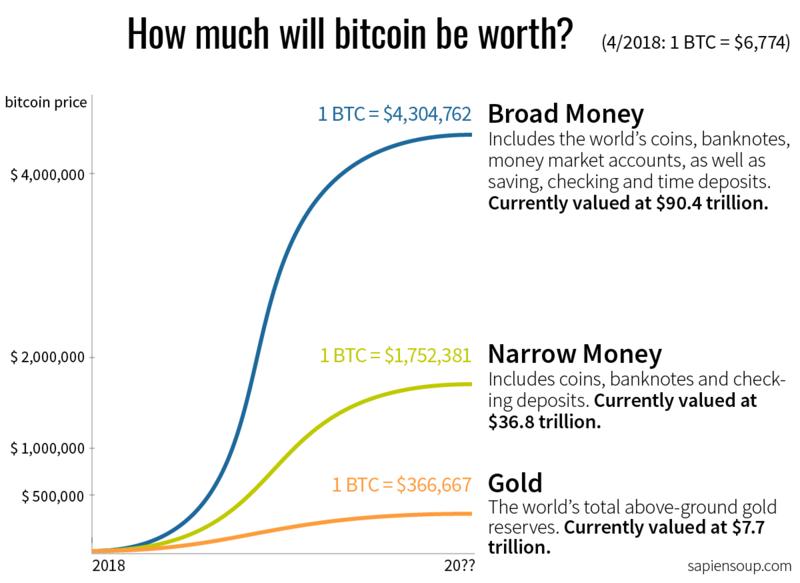 How much will bitcoin be worth? If bitcoin only ever reached the market capitalization of gold, i.e. $7.7 trillion, each bitcoin would be worth $366,667. If it replaced the global money supply, that number would reach millions of dollars. I want to be clear that this is a quick and dirty calculation, based on unrealistic assumptions like total market adoption and is oblivious to forever lost bitcoins. The actual bitcoin price will almost certainly turn out differently. Having said that, I do believe that cryptocurrencies are the future of money. There are good reasons why bitcoin is superior to gold or ordinary banknotes. If you’d like to know what those reasons are, I recommend reading The Bullish Case for Bitcoin. So don’t consider the above calculation financial advice. Rather, it’s a necessary assumption to answer our original question: how many decimal places does a good bitcoin unit system need to accommodate? Let’s take a look at future prices of goods. I projected the price of a coffee ($3), a Tesla Model S ($71,000) and a 2-bedroom home in Manhattan, NYC ($1,800,000) onto these three different scenarios. Even in the broad money scenario we’d end up with relatively bulky numbers if prices were denominated exclusively in bitcoin and satoshis. 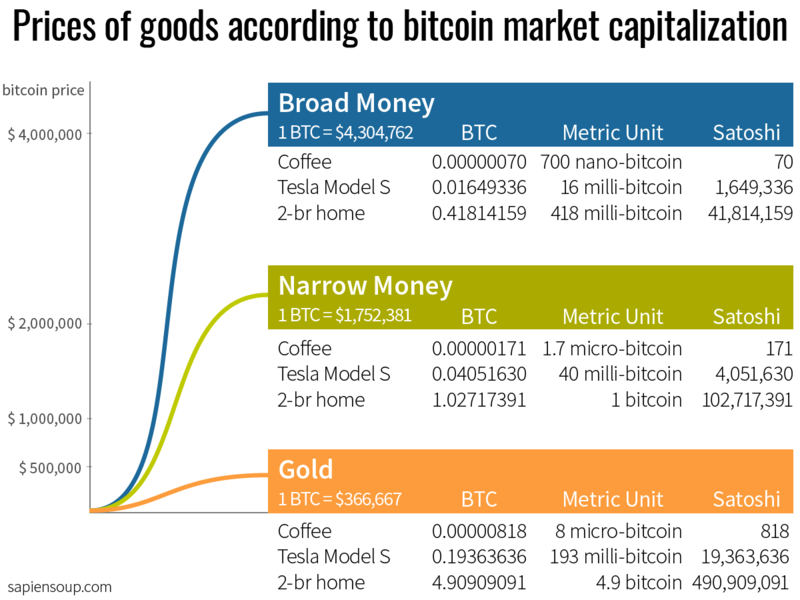 The metric unit system, however, offers an at-max 3-digit denomination for any price, regardless what the bitcoin market capitalization will turn out to be. Merely having a solution, doesn’t equal the adoption of a solution. In order for the metric approach to become the prevalent unit system in bitcoin, people have to actually use it. Some bitcoin wallets have started offering metric denominations, but one rarely hears ‘milli-bitcoin’ used in everyday language. So, why aren’t people using it? I think the reason is that bitcoin has been more commonly used in written language than in spoken language. 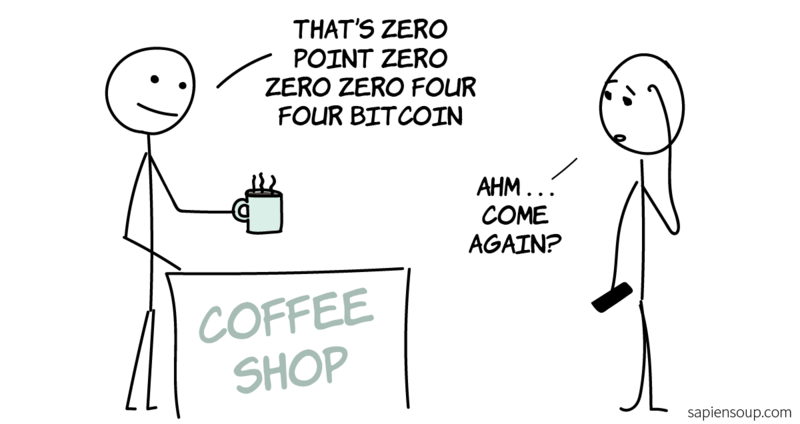 Reading “0.00044 BTC” poses less of a challenge to the human brain than hearing “zero point zero zero zero four four bitcoin” in conversation. Today, most people use bitcoin either as a store of value or for trading. 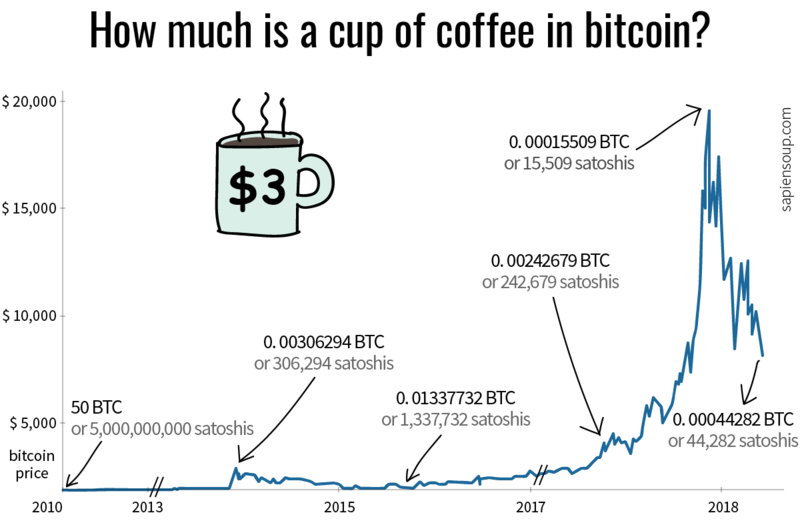 Hardly anyone uses bitcoin to pay for coffee. I believe that will change in the future, though, and as we see more and more prices denominated in bitcoin, the demand for an easy unit system will increase. No one can really predict which terms will make it into popular language. Maybe it’ll be millies and mikes and maybe it won’t. After all, who would’ve predicted that we’d ever have words like “selfie”, “hangry” or “swag”? What really gets me is this: why on earth would bitcoin’s creator make 1 bitcoin equal 100 million satoshis in the first place?! If Satoshi Nakamoto had given it just one more decimal place, making 1 bitcoin equal to 1 billion satoshis, bitcoin would have been metric-friendly out of the box: we would have had perfect milli, micro and nano divisions. I don’t get it. Maybe the failure to design for metric-system friendliness is the best proof yet that Satoshi Nakamoto was an American. I’m just a lay user sharing her thoughts. If you want to hear actual experts talking about bitcoin, you might want to check out the following links.